Injury prevention is the most underrated aspect of bodybuilding training because one serious injury can either put you out of training for life. And most importantly: A serious injury will have a very negative effect on the quality of your life. You will go through each day in agonising pain. No muscle gains are worth that pain. These are the most common injuries you will see on strength and bodybuilding programs. Once you’re dealing with serious rotator cuff injuries, elbow tendonitis, a herniated disc and neck pain all your upper body training is severely limited. And once you have knee pain and hip pain, you can’t do most lower body training. Right now I can think of 5 friends who had rotator cuff injuries because of training. 2 of them needed a shoulder surgery to be able to function again and all of them have now lost their gains. They will never be able to train their upper bodies at a good intensity again. This is why preventing injury is so underrated. By staying injury free, you can keep on packing muscle mass for the next 10-20 years and end up with a much more powerful physique than the guy who goes hard for 3 years and then get’s injured. The best training system for staying injury free is high volume training and now I’ll explain why. When you look at the various bodybuilding training systems out there, you will find that nearly all of them can produce muscle gains. But here’s the main difference: Some training systems have much higher injury rates than other. I have personally used my training system to stay 100% injury free 7 years into hard training. I’ve also used my training systems to train over 100 clients the last 4 years and not a single one has gotten a serious injury. Why does my training system work so well? Because it’s based on high volume training. Instead of going all out on each set with a heavy weight, you are using higher reps and spreading the workload through a bigger variety of exercises. You end up spending more time training at the gym, but the end-result is that you prevent injury. Just think about when most training injuries happen. You are using more weight than your joints, ligaments and tendons can handle. It usually takes 3-6 months before your joints, ligaments and tendons adapt to the amount of weight your muscles can lift. Your technique is off. In most cases, your technique breaks when you are trying to use more weight than you can handle. When you do heavy lifts at a high intensity it’s just a matter of time before your technique slips up or you use more weights than your joints, ligaments and ligaments can handle. I can’t think of a single lifter who has lifted heavy at a high intensity for 10 years who is 100% injury free. And I have never seen a guy over 50 who has a great physique and lifts heavy at a high intensity. This is why you will see that trainers and coaches who promote heavy training at a high intensity have had injuries themselves. There are almost no exceptions here. Lift heavy at a high intensity for long enough and let your body pay the price. In the meanwhile, those who trained smart at a lower intensity have continued training into their 30s, 40s, 50s, 60s and even 70s while staying 100% injury free. Training smart means that you use the minimum required intensity and weight for building muscle mass. This by default requires that you compensate for the lack of heavy load and intensity with high volume training (more sets, reps and exercises). A good source of wisdom for bodybuilding training is Lee Haney who won the Mr. Olympia 8 times. He had one of the muscular physiques in the world and he rarely maxed out on his heavy barbell lifts. If he could max out 500 pounds on squats by being explosive, he would work mostly with 200 or 250 pounds and use smooth, clean reps in a pumping cadence. He trained intelligently and ended his bodybuilding career 100% injury and pain free. The same goes for Serge Nubret who had a world class physique and promoted “making the weight feel harder” so you can get the same muscle building effect by using less weight. Both ended their bodybuilding careers injury free. Now, look at the opposite end of the spectrum: Dorian Yates and Ronnie Coleman. Both of them trained at a high intensity with heavy weights. Ronnie Coleman won Mr Olympia 8 times and lifted heavy weights at a very high intensity. He ended up with 7 injuries and in a wheelchair. Dorian Yates won Mr Olympia 6 times and lifted heavy weights at a very high intensity. His career ended because of chronic acute injuries, including torn biceps and triceps. All of the guys above reached close to their genetic muscular potential, but the high intensity guys suffered through debilitating injuries. You will find this to be the case everywhere you look. Fitness models, personal trainers, bodybuilders, athletes, skinny guys, muscular guys, fat guys. Those who consistently train with heavy weights at a high intensity end up with a lot more injuries. Anytime you find a program by a known guy who promotes heavy weights at a high intensity, you can google search his name + injury and you will be almost guaranteed to find that he has been injured. So why do skinny-fat hardgainers with small bone-structures keep following heavy weight programs done at a high intensity? Because everyone likes the idea of going into the gym 3 times per week to train heavy. It saves time and you satisfy the ego by lifting heavy weights. No one likes the idea of going into the gym 6 days per week and training for over 1 hour with much lighter weights. It requires that you free up more time in your schedule and you don’t get the ego boost that you get from using heavy weights. However, to get results and KEEP your results, it’s important that you put the ego aside and do the type of training that is both safe and effective. When looking at the history of bodybuilding, you will find that both high volume training and high intensity training have produced world class physiques. The main difference is that high volume training is much safer. And in my experience, high volume training also produces better results for skinny-fat hardgainers. With high volume training, you are spreading the workload through a bigger variety of exercises. In other words, you are training at a lower intensity but spending more time at the gym each week. For hardgainers, spending more time at the gym each week is a huge benefit because it allows you to thoroughly work the muscles that don’t respond well to training. By spending more time at the gym, you can do a bigger variety of exercises for each muscle group that doesn’t respond well to training. Using a variety of exercises for each muscle group is important because one of the main drivers behind complete muscle development is training the muscles from a variety of angles. This stimulates a broader variety of muscle fibers and maximizes development. Using the biceps as an example, you will need one exercise for the outer head, one for the inner head and one for the brachialias that runs under the biceps. When you select 3 different exercises for the biceps that stimulate the different parts of it and you use good technique, you will feel each part of the biceps getting worked properly. This means you are stimulating a larger amount of muscle fibers and thereby you will potentially see more growth. If you only do 1 exercise for the biceps, you will not be able to get optimal development there because you won’t stimulate all muscle fibers sufficiently. As a result, using a variety of angles is the only way a true hardgainer can get anywhere close to his muscular potential. The same isn’t the case for a genetically gifted guy who responds fast to training. Guys who are gifted will often be able to do just 1-2 exercises for a muscle group and get amazing pumps in that muscle group and stimulate more muscle fibers. As a result, they can grow their muscles by using less exercises at a higher intensity. In contrast, most skinny-fat hardgainers have no muscle groups that respond easily to training and some have 1-2. I know this because my shoulders, chest, lats, upper back, biceps and triceps had very minimal development 2 years into hard training. Then I made the switch to basic bodyweight training and followed Serge Nubret’s main training principle of “making the weight feel harder”. For bodyweight training this meant that I tried to make my muscles work as much as possible on each rep. This simple change in technique led to amazing gains. 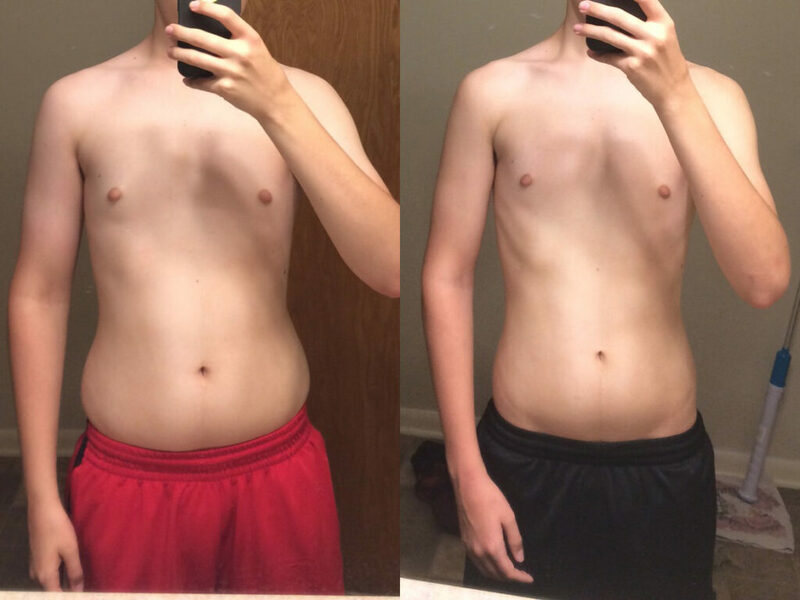 I was far from happy with my gains, but at least I started seeing changes. This was the first learning lesson in my bodybuilding training: Form is more important than how much you lift. Then I took my training to the next level and added a variety of exercises for the muscle groups that mattered the most. When I did that, I felt my muscles working in different places. For example, I could feel different parts of the triceps get stimulated when I switched up the grip on various cable push downs. I’ve now turned all my weak muscle groups into strong points and they keep growing each year. If I had kept training with heavy weights at a high intensity, I would never have fully developed my weak points and I would already have injuries that put me out of training. This is why I personally use an average of 4 exercises per muscle group. After a lot of testing the last 5 years, I consider this to be the bare minimum to see optimal development. Monday this week I released The SKINNY-FAT TRANSFORMATION 8 Week Maximum Size Program and it will be available until Wednesday 1 November 2017. Great technique over heavy weights to minimise the risk of injury. Exercises that train all the important muscles from different angles so you can stimulate a bigger amount of muscle fibers. I’ve selected the 19 best exercises that will help you build up a V-tapered upper body with broad shoulders, squared pecs and big arms. These are all the muscle groups that skinny-fat guys struggle developing the most. Of course, you most likely won’t end up looking like Steve Reeves regardless of how you train and eat since that requires elite level genetics. However, by training the right way you will maximise your potential and end up looking better than 90% of guys who lift. If you look at Steve Reeves’ routine, you will see that he put his leg training at the end and his ab work was kept to a minimum. By doing so, he prevented overdeveloping his mid-section and lower body. He also did minimal work for the traps to make his shoulders appear wider. In other words, he prioritised his training. And this is where a lot of skinny-fat guys go wrong. They read about the importance of training the shoulders, upper chest, arms and lats, but end up getting injured. Not because of major mistakes but because of getting the small details wrong. Doing bad exercises that are hard on the joints, ligaments and tendons while providing minimal benefit. Not balancing out vertical pushing and pulling with horizontal pushing and pulling. My program takes care of all these things and keeps the risk of injury to a minimum. As I mentioned earlier: I’m now +7 years into hard training and I’m 100% injury free. Being injury free 7 years into my training means that I can continue enjoying my training and keep packing on muscle mass year after year while most of my friends had to quit lifting a long time ago. When you follow a training program there will always be a risk of getting injured, but with my program the risk is extremely low. I’ve coached over 100 men in my online coaching program over the last 4 years, and there hasn’t been a single serious injury. I personally consider risk of injury to be the most important element of program design and so should you. If you get seriously injured, you will lose a lot of your gains and you will struggle with making progress. As a result, a good program needs to be both safe and effective. My program achieves both of these goals. So is my training program right for you? My training program is designed for all skinny-fat and skinny hardgainers who want to put on as much muscle mass as possible in just 8 weeks. It’s versatile and can be used by hardgainers of all training levels. You don’t need to have a strength or conditioning base from previous programs to follow it although it’s always a benefit to have a good strength base. The program is meant to be followed for roughly 8 weeks at a time. However, the program can be re-used for multiple training cycles throughout your training career. You will be in the gym 6 days per week for around 1 hour and train every muscle group twice per week. This allows enough time to train each muscle group from a variety of angles and thereby stimulate a large amount of muscle fibers. How much equipment do you need? A fully equipped gym would be ideal for this program, however it’s not a requirement. The program has 19 exercises. 14 exercises can be done with dumbbells and an adjustable bench. As a result, you can get away with having dumbbells and an adjustable bench as long as you make a few tweaks to the program. If you are limited to dumbbells and an adjustable bench, just shoot me an email after purchase with a list of the equipment you have at your disposal and I’ll help you find replacement exercises. In addition, I got a lot of questions about nutrition for bulking up. If you’ve followed my blog for a long time, you know about the importance of nutrition. When you’re skinny-fat, you have a naturally low testosterone production and poor nutrient partitioning. In other words: Your body is bad at utilising food for muscle gains. This makes it even more important that you get in the right type of food at the right time. Half of the time when skinny-fat guys fail to see results, it’s not because of their training but because of their diets. Eating too much protein. This leaves less room for carbs and fats which are important for optimal training performance and muscle gains. The main sign here is constipation. Eating low quality carb sources such as pasta and white bread. The main sign here is bloating. Not eating enough fruits and vegetables. The main sign here is low energy levels. Following extreme diet approaches such as low carb, KETO or IIFYM. These are all fad diets that don’t produce lasting results. Not tracking body-measurements and bodyweight on a weekly basis. If you don’t track your progress, then how do you know if your diet is working? In the new program, I make dieting as easy for you as possible. You will find 4 muscle building diet plans with 47 food choices. The diets follow a basic 3 meal a day schedule (breakfast, lunch, dinner) and outline exactly what you can eat with each meal. With each meal you will find 11 options for protein, 20 options for carbs and 16 options for fats. You can combine any options you like which means that you will have almost endless meal options each day. The diets are dairy free and can easily be adjusted for those of you who are Vegan or those of you who don’t tolerate gluten well. I’ve also included a comprehensive 33-page diet guide where I cover how to select the right diet plan for you and how to adjust the diet plan based on how your body responds to it. In other words, I’ve made sure that your training and diet are covered from every angle. I’ve decided to make the program available until Wednesday 1 November 2017. I look forward to see all the success stories coming in the next 8 weeks. PS: A lot of long time readers asked me about the difference between the 8 Week Maximum Size Program and the SKINNY-FAT TRANSFORMATION Bodyweight Program. The 8 Week Maximum Size Program is ideal for gaining weight and putting on maximum muscle size while the bodyweight program is better for losing fat and building a strength base. If you have excess body-fat and you look closer to the photo on the left, start with the SKINNY-FAT TRANSFORMATION Bodyweight Program. If you are lean and look closer to the photo on the right, start with the SKINNY-FAT TRANSFORMATION 8 Week Maximum Size Program.